My Metro Station of the Month is Bastille which is a very busy station as it is on three different metro lines: 1, 5 and 8. The remarkable platforms which I suggest that you should see are on line 1 in both directions: Château de Vincennes and La Défense. 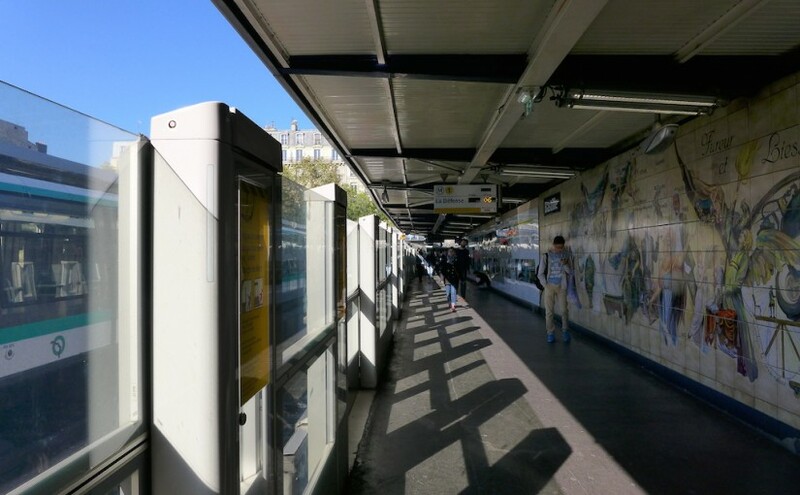 The easiest way to reach them if you are coming from the outside world and do not want to walk for a long time underground is to use the Metro entrance located on the Boulevard Bourdon. Indeed there are about ten exits in total, located on all sides of the Place de la Bastille and the underground corridors are very long! The platforms of the Metro Bastille are worth seeing for several reasons. Firstly they are located below the road level but above the Bassin de l’Arsenal and the greater part of them is outside. The eastbound platform, direction Château de Vincennes, offers great views on the boats and quays of the Bassin de l’Arsenal: Not to be missed! Secondly the platforms are curved and even have the sharpest curve used by the subway trains in Paris. And finally the walls, especially on the westbound platform in the direction of La Défense, are decorated with a beautiful colourful mural painting which represents the various steps of the storming of the Bastille. This work of art was designed and made by two painters of the ‘Ateliers des Carrelages de la Bussière’ in 1989 so as to celebrate the bicentenary of the French Revolution. Back to earth: Have a look at the Place de la Bastille with its central column and the Paris Opera. From there there is much to do! You can walk westerly towards the Place des Vosges and Marais area, stroll along the Bassin de l’Arsenal in the south, easily reach the Promenade Plantée on the Viaduc des Arts easterly or enjoy the trendy cafés and fashion shops in the streets between the rue de la Roquette and the rue de Charonne in the north-east. The choice is yours!